Aisha opened her eyes to find herself laying on a jagged rock. Her memory began to come to her with flickering pictures, like an old flip book. 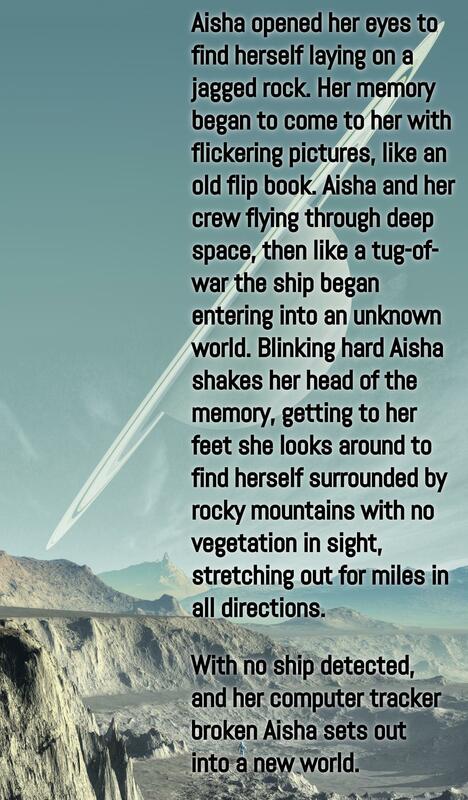 Aisha and her crew flying through deep space, then like a tug-of-war the ship began entering into an unknown world. Blinking hard Aisha shakes her head of the memory, getting to her feet she looks around to find herself surrounded by rocky mountains with no vegetation in sight, stretching out for miles in all directions. With no ship detected, and her computer tracker broken Aisha sets out into a new world. Nicely done, Kaye. :-) Great image to go along with the story! Thank you guys for all of the love! I recently put together my author page and will hopefully be sharing some more ideas, and thoughts there.